Kakadu National Park is one of Australia’s most important and spectacular national parks. Kakadu provides the visitor with a great introduction to many of the regions key elements: landscape, wildlife and weather. While interaction with indigenous folk may be somewhat limited, dialogue with local tour operators, guides and national park officers provide the visitor with fascinating insights into indigenous culture. And of course there's wonderful rock art. To maximize photo opportunities it’s desirable to be photographing with the best possible light. Early or late in the day is ideal. In the middle of the day overcast weather reduces contrast, helping to maintain detail in shadows and highlights. Alternatively, inclement weather often provides dramatic light (e.g., quality, direction and/or color) on the edges of the weather. That is just before and/or just after the onset of rain. However, care should be taken during the wet (i.e., monsoon). You don’t want to be driving nor far from shelter when the rain comes down. Nonetheless, to witness the power of a monsoonal downpour, from the relative safety of your hotel, is an amazing experience. Whether it’s the wildlife, the landscape or the heat and humidity there’s no doubt that, when visiting Kakadu National Park, you become keenly aware of the environment that surrounds you. I’ve had the good fortune to visit Kakadu on three separate occasions. While it’s an incredible place with opportunities for great photography, I’ve never felt like I belonged there. It’s just far too wild a place for me. Behind the scenes view of a film crew at the Abangbang Billabong in Kakadu National Park, Australia. While I enjoy the solitude often associated with landscape photography, Kakadu is the kind of environment where it’s advisable to be in the company of others. A sunlit water lily on the Abangbang Billabong in Kakadu National Park, Australia. The other consideration to set yourself up for success is to be where and when the action occurs. A lot of wildlife is most active at the edges of the day (i.e., early or late). So it’s important to plan your trip so that you can be in position to record the light caressing the landscape, or (safely in the boat) on the water when the birds or crocodiles are likely to be both visible and active. Just remember that, this close to the equator, the sun approaches the horizon and sets very quickly. The above image of a darter bird was made from a boat on the Yellow Waters Cruise in Kakadu National Park. I've taken the cruise in both the wet and the dry Top End seasons. All up I’ve done so on four separate occasions (twice on my most recent trip), including both early morning and late afternoon. All trips were great as I got to witness and photograph the significant changes that occur to the waterway and surrounding environs at different times of year. My visit back in 2007 coincided with the heaviest rainfall in the region for 100 years. Of course changing rain patterns worldwide do not always result in less rain, as is the case in Melbourne, where I currently reside. Other places will see significant increases in rainfall, whether there are dams to catch and hold that precious rainfall or not. The environmental balance can be a tenuous one. A local guide told me that, in the case of Kakadu, a significant increase in long-term rainfall would have a catastrophic effect on the local environment. I’m reminded of the saying that the only constant we have is change. Kakadu National Park is accessible, via around a 3-hour drive along a major highway, from either Darwin or Katherine in Australia’s Northern Territory. The road through the national park is also sealed, though many of the park’s attractions need to be accessed down dirt roads or walking tracks. The starting place for the Yellow Waters Cruise is just off the highway at the Cooinda Lodge, right next to the magnificent Yellow Waters Billabong. As well as bush camping sites and a variety of lodges and a caravan park there are two very comfortable places to stay when visiting Kakadu National Park. 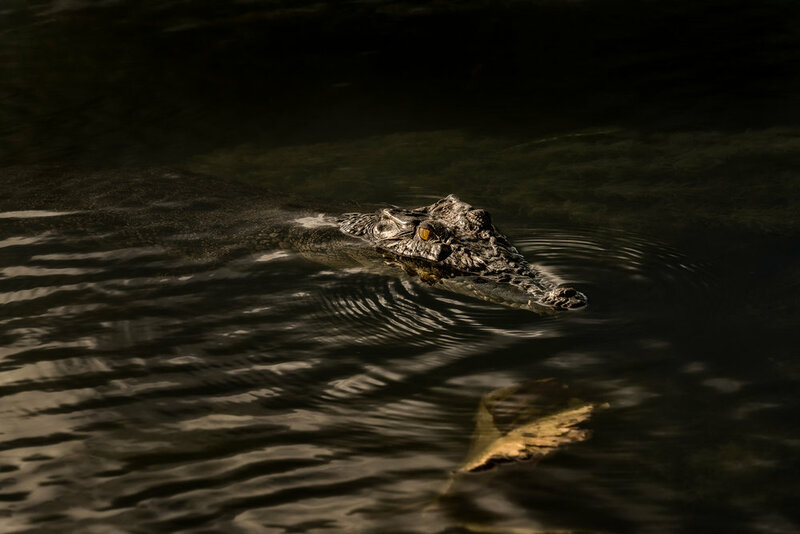 The Mercure Crocodile Hotel is just a few kilometers outside the park on the edge of Jabiru, the small town on the northern edge of the park that’s close to the Ranger Uranium Mine. Nearby the entrance to the mine is the Jabiru Airport where you’d go to hire an airplane or helicopter flight for a wonderful overview of the park from above. I tried for several days to book a seat on a helicopter as that could, potentially, provide more opportunities for photography. I was the only person trying to do so and, to get a seat, I’d have to pay for two seats which, sadly, was beyond my budget. In the end I opted for a seat on a small fixed wing plane. It was a fun trip though, as you can see from the above image, I found it extremely difficult to photograph through the tiny windows on the plane when so tightly belted into my seat. If you have three or four days in which to explore Kakadu National Park I’d advise splitting your time between the Mercure Kakadu Crocodile Hotel and the Cooinda Lodge in the south of the park. The food and staff at each place is great, just don’t expect anything other than very basic and sketchy internet coverage. Of the two I found Cooinda to be a more pleasant place to say, with superior rooms and a nicer restaurant and bar. But the biggest advantage of staying at Cooinda is that your room is only a few minutes walk from the boat ramp where the Yellow Waters Cruise commences. This is a critical point as it’s a good 45 minutes drive from Jabiru down to Cooinda and I wouldn’t advise doing so in the dark on your way down to a sunrise cruise. I had to transfer a sunrise cruise due to the torrential rain that was falling at Jabiru. I just didn’t think it was safe to drive, particularly in the dark, down to Cooinda. As it was the cruise went ahead and it would have been interesting to have photographed, under the boats canopy, in the rain. Nonetheless, large aluminum vessels are not necessarily where you’d want to be during a lighting storm. Fortunately I was able to transfer my pre-purchased ticket to the next morning. I moved into Cooinda and boarded the cruise the very next morning. The weather was fine and I had the advantage of being the only customer on board which allowed me to move around the launch and make lots of photos. What an amazing experience I had photographing that morning on the Yellow Waters Billabong. And my guide was really fantastic guide.